Damaged Roof? Here’s What You Need To Know About Insurance Claims. Wind, hail, and falling tree branches are all possible damaging side effects of a summer thunderstorm. Unfortunately, insurance companies sometimes prorate your roof coverage based on the age of the house or roof, the condition before and after the storm, and other details that are overlooked. This can lead to your claim being denied and having to foot the repair bill yourself. Instead of getting trapped in the situation, check with your insurance adjuster, read up on your coverage, and understand what is and is not covered before the storm hits. Filing insurance claims for roofs can be tricky if you do not follow every step in the process exactly. Insurance companies are not trusting entities, and they will want documentation. They will often send an insurance inspector to your home to examine your roof. If the damage is caused by a covered event or it is listed as a covered loss in the policy, then it is usually simply a matter of the amount they will pay on the claim. There are a variety of different occurrences that can cause damage to your roof. 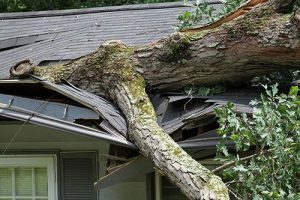 Hailstorms, high winds, and trees falling on roofs are often reasons to file an insurance claim. Shingles and other roofing products can be blown off and hailstones are known to leave obvious indentations in the roof surface. Will Your Insurance Company Cover the Entire Cost of a New Roof? You may be surprised to find out that some policies do not cover the entire cost of a new roof or prorate for the age of the roof. Some insurance claims for roofs are initially denied, and some are paid out on a depreciated value for the roof. You may also have to pay any deductible amount that you chose for your policy before the insurer will pay anything. Insurance claims for roofs vary in results because each policy is different. If you have any questions, you should contact the company that issued your policy. Policies that are more expensive may cover more than a cheaper option, and some policies do not cover certain events or damage types while others do. Most insurance policies include a deductible. This is the portion of a covered loss that the insured must pay. Under most circumstances, the insurance company subtracts the deductible before they pay the claim, so the insured is not required to pay anything up front. With insurance claims for roofs, you may have to allow an adjuster to inspect the damage. In other cases, an estimate from at least one roofing contractor will need to be submitted to the insurance adjuster in your case. Once a claim is approved the insurance company will cut a check, usually for the depreciated value minus any deductible. The initial check may be in both the name of the mortgage holder and your name, and the mortgage holder will have to sign off the check in this situation. Once the roof is repaired then a second check may be cut for any additional amounts involved in the actual repairs. What if the Insurance Company Denies My Roof Claim? Insurance claims are not always paid. If you believe that the insurance company is wrong and the damage should be covered by your insurance policy, you can appeal the denial. Your policy is your contract with the insurance company. If your appeal is denied you can consult with an attorney to see if you have further recourse. Having a knowledgeable roofing installer can prevent damage and help save money on repairs in the long run. The Chuba Company has installed more than 700 roofs using our dedicated and experienced crew of professional roofers. We also hold an A+ rating with the Better Business Bureau and are GAF Master Elite certified contractors, a distinction held by only 3% of all roofing contractors. And when you compare The Chuba Company’s warranty against the competition, you’ll see the difference. And don’t forget – Chuba gives a lifetime workmanship warranty on all exterior work.